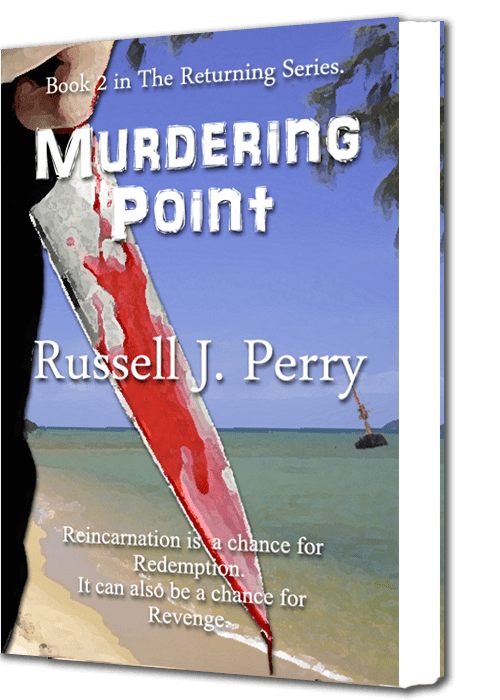 Murdering Point, by Russell J. Perry .. The Returning .. Book 2. Today is the day .. Murdering Point is available. At last, the words are all written, the editing done (I hope), the cover has been struck, the files are loaded, and Murdering Point has been transformed from project to book. It’s a great feeling when you put the final touches to a labor of love, but it’s also a bit scary releasing it out there to share with everyone. However, that scary feeling diminishes somewhat, each time a reader lets you know that they enjoyed the read. Hopefully that will be the case this time. The second book in The Returning Series, is set in and around Innisfail, the Atherton Tablelands and, as the title would suggest, Kurrimine Beach (Murdering Point is the old name for Kurrimine Beach). Both books are fictional works and could be categorized in the “Suspense Thriller” genre, although there is a central paranormal thread of Reincarnation, running through the two stories. I chose the reincarnation theme for my first two novels, as it has always been an area of interest for me, and as an avid reader, I enjoy the works of Stephen King and Dean Koontz, both renowned for their macabre imagination. However, I will put away my paranormal imaginings for my next project. I am working on an historical saga, partly influenced by my grandparent’s immigration to Australia in the early 1900s. There is another joy that you feel when you finish writing a book. ; it’s the joy of starting a new story. I hope to finish the novel and publish toward the end of 2014. If anyone is kind enough to purchase Murdering Point, in either format, could I ask you please to go into your Amazon account, and write a short review. Thanks … Russell.